Beauty and fashion have always worked hand-in-hand when it comes to retail. Now, with the growth of subscription services it seems like the beauty industry has helped the market stumble into a retail equation that works. But as a new type of business and a new customer relationship, what does the future of ecommerce look like now that we’re headed down uncharted, or should we say “unboxed”, territory? The subscription service is not a new concept: the customer pays a recurring flat fee, the retailer sends products equally recurring in return. But in 2010, a twist on the old concept came into the market that wasn’t the standard “wine of the month” package. Birchbox revitalized the subscription based model off of the hypothesis that consumers would be willing to pay for beauty samples in lieu of an initial purchase of a full-sized products. By testing samples of unknown products, Birchbox hoped that customers would try out the new products, fall in love, and ideally purchase the full-sized versions, leading to a long-term customer-retailer relationship of suggestion and purchase. Other competitors started to join the space, including Ipsy and Play! by Sephora. The model seemed to be working and the millennial customer who relished the value and the surprise of the concept responded accordingly. While beauty paved the way, other box-types popped up including anything from food (Blue Apron and HelloFresh), to pets (BarkBox). and even shaving products (Dollar Shave Club). It seemed like the subscription service business model was working and customers were committed to starting this long-term relationship together. And they were right, sort of. Customers did want to purchase, but it was a bit different from what was originally expected. While the original intention was that subscription services would put the focus on the long-term relationship with the customer, it was the customer itself who redefined what this relationship would look like. They wanted a no fuss, low-commitment relationship with exactly the products they needed - and quickly. With a total market shift that reflected continual brand apathy and a preference for convenience, the subscription based model unintentionally fulfilled some of these needs. Customers found products that worked for them without the upfront investment and with the added education and discovery piece if they so desired. Take for example a new skincare product you may get in your Birchbox. Without paying full price you can test it and find out how to use it while never having to go to a store. In the case of Birchbox, customers showed the same apathy towards brand affiliation but still wanted curation and reliability - minus the hassle of combing through options or going to a store in person. Without the desire to be “bothered” or fully commit to options, subscription services saw the advent of what Birchbox CEO, Katia Beauchamp, referred to as the “passive consumer”. As Beauchamp explains, 80% of Birchbox customers are “passive”, meaning they may spend the minimum or display the lowest level of enthusiasm. They will keep their monthly subscription and occasionally purchase a full-sized product, but don’t count on them for it. Yet in sheer mass, their contributions are collectively significant and can shape the future of the market - if retailers can figure out how to continue to meet their needs. With the rise of subscription services in the retail industry, retailers have had to rethink who their customers are and what they really want. Brand-fans have become a small minority creating little impact who they can no longer look to as their core customer base. Now products and the actual process of the purchase have to hold their own weight, especially in the midst of passive customers who have no problem jumping from one site and brand to the next in search of the best products to fit their lifestyle, all while taking their money with them. Does your wardrobe fit into a box, too? While beauty and apparel tend to go hand-in-hand, the industries have not always operated in the same manner. But apparel, too, has seen success with the subscription service model. Only a few months after Birchbox was founded, CEO Katrina Lake developed the idea for Stitch Fix while conducting consumer research at Harvard Business School. Not only did she find that shoppers did not enjoy going into stores but they also wanted to spend less time actually choosing the products - classic symptoms of the passive consumer. Thus, using strong customer based algorithms, she launched a subscription service that let data (and a stylist) pick the outfits for you. After filling out a style profile, you receive a box with five apparel or accessory pieces for $20 styling fee and only pay for the pieces you keep. By providing feedback after each box the choices become closer and closer to the customer’s preferences. Much like Birchbox, the model worked. In 2016 the company reported total revenue of $730 million, after only 5 years of operation, and the company continues to grow with added men’s and plus size lines. What about Stitch Fix’s model has made it so successful? For one, it has found a way to meet the passive consumer’s need for convenience and curation by investing in teams of data scientists and stylists to personalize each box with minimal effort on the part of the customer. It also addresses a pain point that beauty doesn’t necessarily have to face: fit. Across the apparel industry one of the most stressful components of shopping, especially online, is how the pieces fit. By delivering pieces to their doorstep with no fiscal commitment, customer’s can try on pieces risk-free and on their own schedule. It’s personalization, with your body-type in mind. 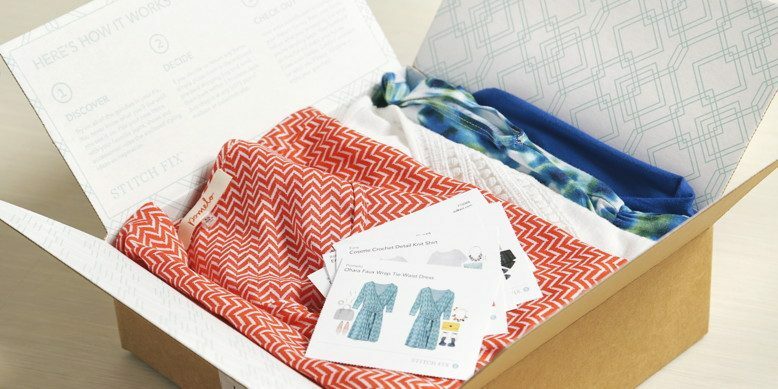 By delivering on convenience and still capturing the importance of specialization and curation, Stitch Fix has shown that a subscription model can work for your wardrobe. But what about other parts of your life? But if we’re going to talk about the passive consumer who values convenience and speed we really need to address the obvious competition - Amazon. Amazon has already achieved the holy grail of retail relevance with Prime, which is technically part of a subscription model. But what is the piece that is missing that keeps companies like Birchbox and Stitch Fix in business? While the passive consumer of a subscription service may eventually abandon ship for Amazon when they decide to purchase a full-sized product, the first step of suggestion or more “surprise-and-delight” is still beholden to the initial subscription company. Part of the convenience desired by the passive consumer is also not having to invest time into product discovery. With literally millions of products available at Amazon, browsing to find your next red lipstick is not a necessarily fun experience for customers. While their Dash buttons do enable easy re-orders of staple items, there’s zero element of discovery. And it seems that Amazon may be seeing the signs, too - sort of. This past month they released their first fashion subscription service based off of their in-house brands where you can try on clothes without paying for them up-front. But therein lies the issue Amazon might have to face later on. Customers still have to browse to curate their own “box” of clothing as opposed to the curation process provided by Stitch Fix. While convenience is being addressed for fit and wallet, the lack of personalization may be what keeps your traditional subscription services safe for the time being from the big, bad giant. What can the retail industry as a whole learn from subscriptions and new consumers? So if the success of subscription services are a sign of the changing retail landscape and have some distance from the Amazon empire, how can other retailers adapt and take advantage of the market? For one, you have to be prepared to make changes. From a technical and logistical perspective, pivoting to a subscription based platform requires a lot of infrastructure changes: operations through assembly, shipping and packing, a change in the online platform that manages the change in services, and also adjusting relationships with vendors to support the monthly service. Additionally, retailers will have to face the discomfort of chasing after the customer who doesn’t want to chase after them (as unflattering as it may sound). But as a whole, it seems like thinking inside the box is helping to understand this brave new world that we are entering, even if it’s with different results than we expected. Subscription services are showing us that customer’s needs may be different than we thought and the most important customer may be different than we thought, too. If the industry can adapt to a new way of selling maybe there is hope for the retail industry after all, but we’ll have to take it one month, or one box, at a time. Little-by-little, the subscription model is working it’s way into our everyday lives whether you realize it or not. Netflix and HBO Go in entertainment, HelloFresh and Blue Apron with our food. Even your pet supplies can be set up with a monthly subscription with Chewy. With just a glance at your credit card statement you can see all the recurring charges you’ve racked up, and how much the subscription model has wormed its way into your own finances. Even as this model has slowly eaten away at your paycheck, it has also built up your reliance. By thinking less about these automated subscription services, our day-to-day has become more reliant on the model. Whether you realize it or not, we all are the passive consumer.